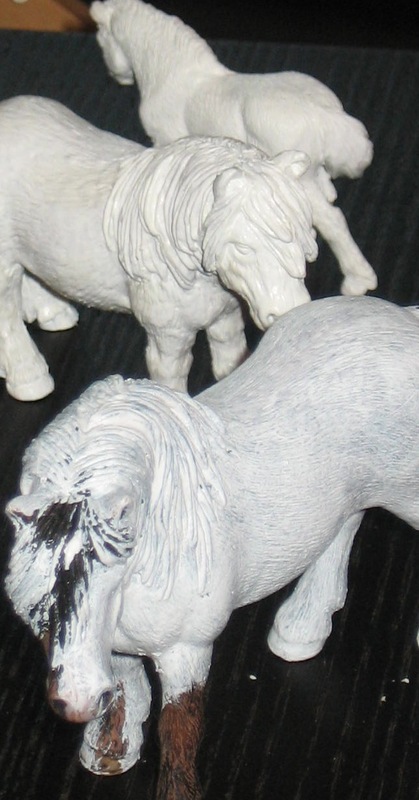 My early customs had base-coats of painted-on gesso, but as soon as I discovered the joys of spray primer I abandoned my gesso for this fast, smooth, easy alternative. Recently I’ve only dug out the gesso for use in making messo to use for wrinkles and veining. For most models, you can’t beat spray primer for smoothness and ease. 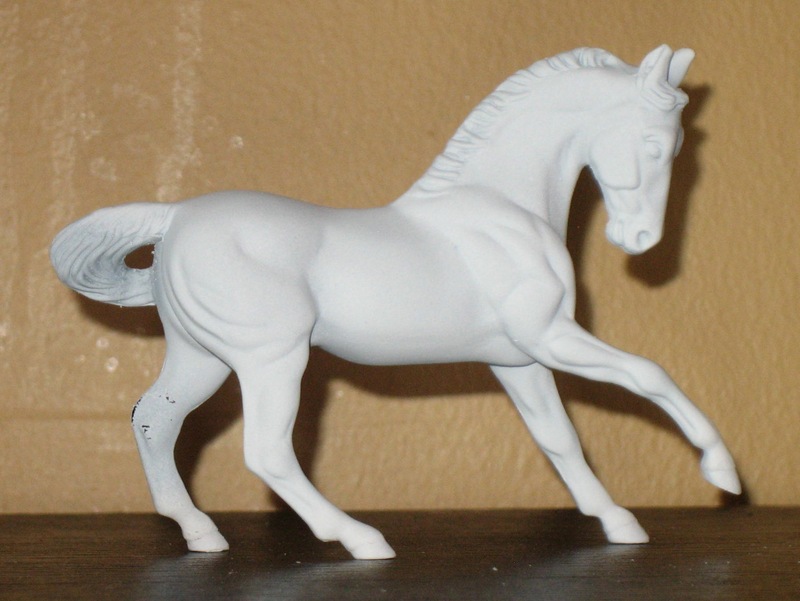 There is one situation in which I prefer gesso as my primer, and that is when the model in question has a textured coat (such as many Schleich and Safari horses or the Breyer Stablemate Donkey). 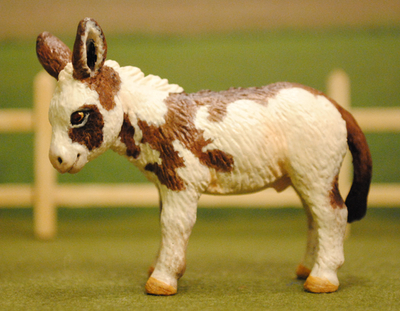 Unless you want to spend hours sanding, customization of these models requires embracing all of their fuzzy glory. The main reason I quickly moved away from gesso is because the application left the model with brushstrokes and showed plainly under pastels. 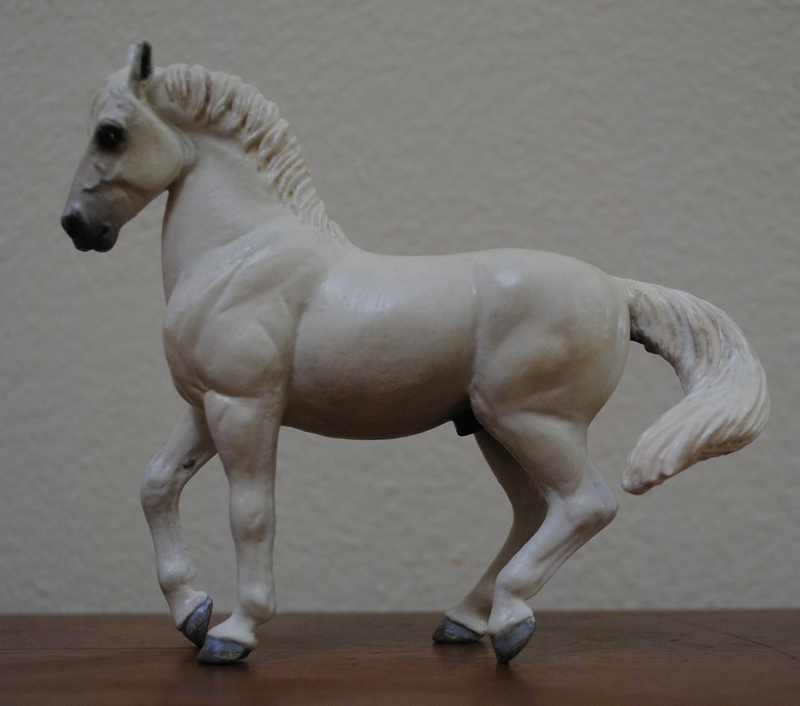 But when you’re starting with a textured horse, brush strokes in gesso can enhance the existing texture and add further hair detail while still providing a nice base coat. 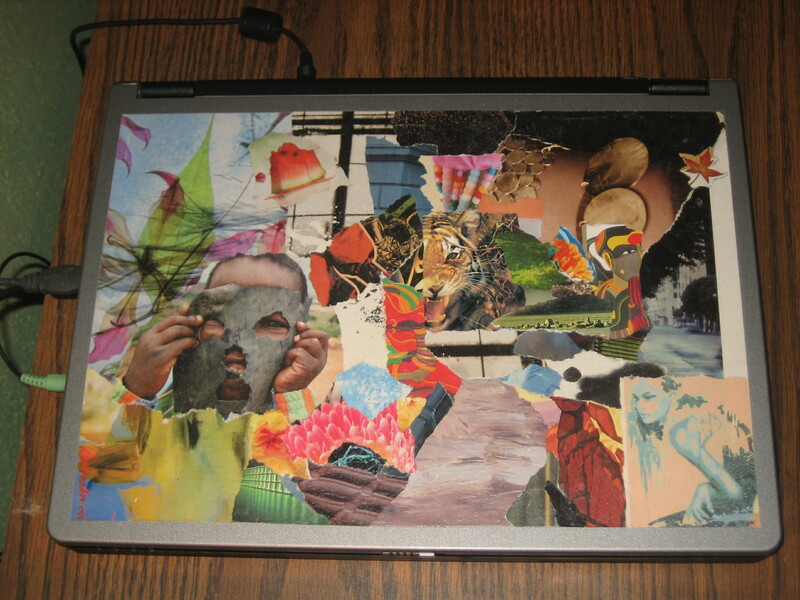 Plus, you avoid the smelly spray primer, which is always nice. 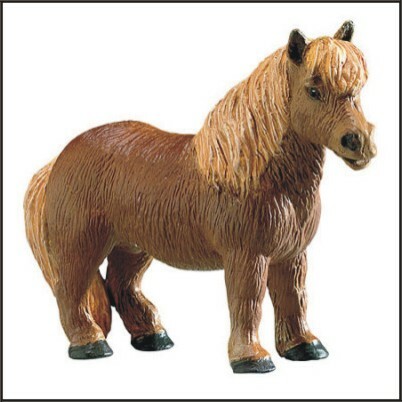 For this textured Schliech Shetland Pony, brush strokes only add to his cute fuzzy look. It’s lovely to not have to worry about brush strokes as you work. The only thing you really need to remember is to reflect the hair patterns- you want most of your brush strokes to go vertically down the horse, not horizontally, always following the hair growth around areas like the flank and belly. 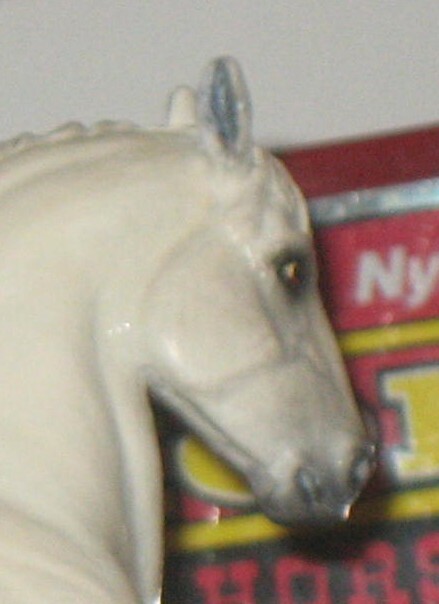 The muzzle should be smoother to reflect the shorter, softer hairs, and of course the hooves should be as smooth as possible. Like spray primer, gesso is sandable when dry, so don’t be afraid to redo an area if it looks wonky. Gesso texture will show under pastels, so make sure you like what you see before you start adding colors. I’m excited to announce that I have gathered the materials for doing a full body hairing, following Ivorytower Stable’s excellent tutorials (parts 1 and 2). I chose a Safari Shetland Pony for my horse and a friend gifted me with some black, brown, and white yarn left over from crocheting, appropriately, a bay horse. 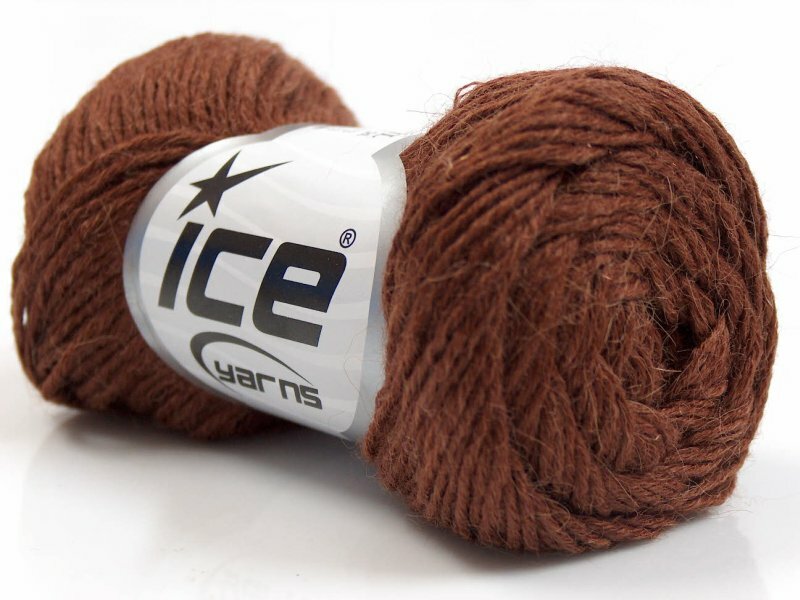 I didn’t really want to invest $15 in three colors of yarn for a first attempt, and luckily I have crafty and generous friends. Yesterday I worked on removing the plastic mane and tail and fixing a few mold flaws. 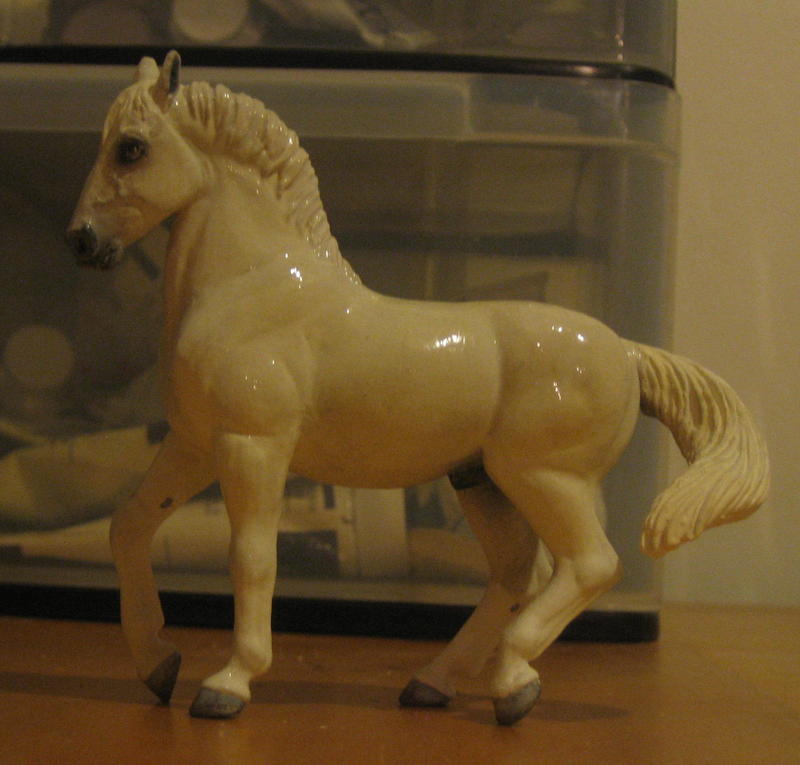 Here he is with his new fetlocks and mouth, new wire tail, and general readiness to paint. He looks pretty rough, but it will be mostly covered up. And today I gave him a basic paint job. It feels strange to be doing details like eyes on a horse with such a rough coat, but I have to remember that it will be covered with hair. 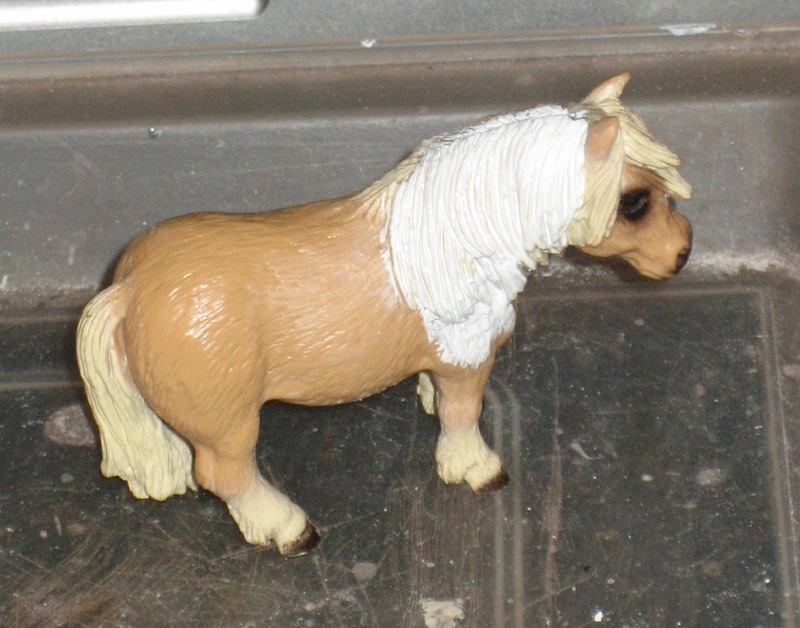 But I do need to do all the painting detail that I’ll want on the parts that will show- hooves and eyes. 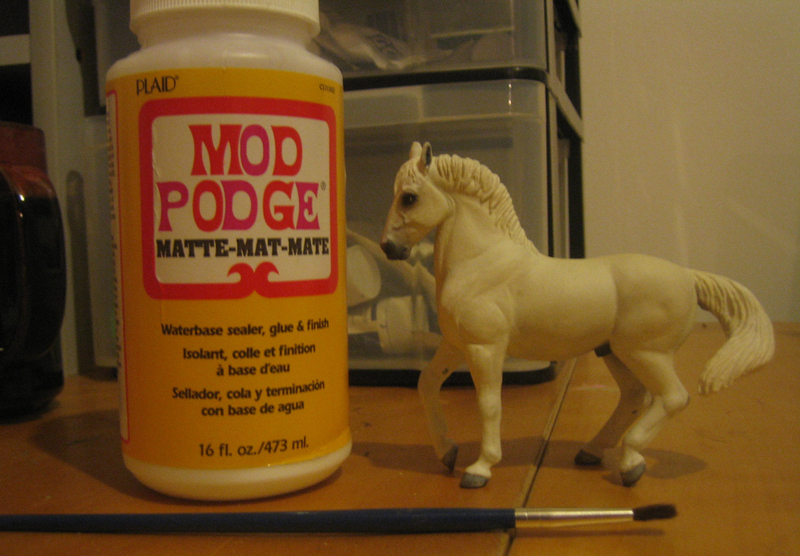 Tomorrow I’ll hopefully do some hoof details and gloss his eyes. Then he’ll relax nakedly on the shelf while I have a busy weekend, and we’ll see about giving him some hair next week. I was watching my new favorite TV show, Community, and was rather delighted to see quite a few Safari models in Annie’s diorama for the environmental club (Season 2, Episode 9 “Conspiracy Theories and Interior Design”). I easily spotted the Chincoteague Pony (left) since I have one, and on the right is the Mythical Realms Pegasus. I believe the other animals are Safari products too. Don’t you wish it was your job to make stuff like this for props? 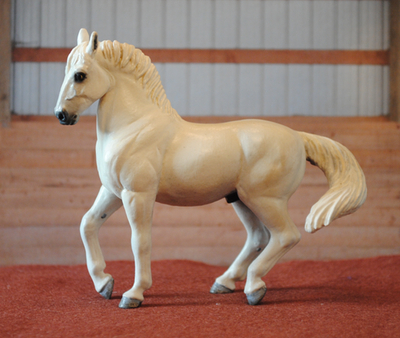 This is the Safari Rocky Mountain Horse Stallion remade to a Tiger Horse mare. 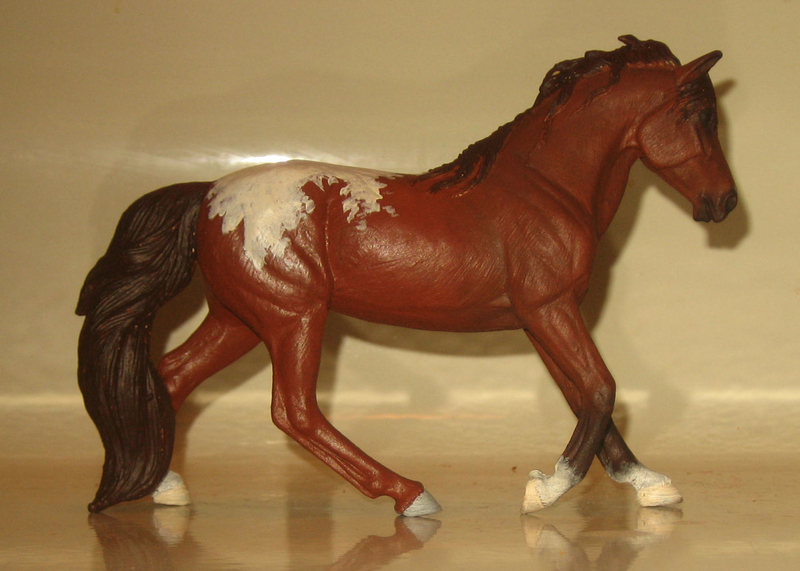 She was first painted with basic colors of burnt sienna (body), burnt umber (mane and tail), white (markings), tan (light hooves) and grey (dark hoof). 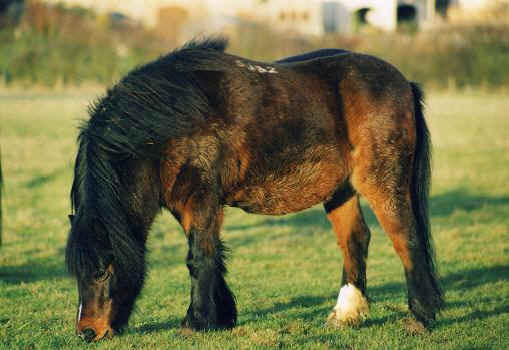 In this picture she has also had one layer of pastelling on the front half of her body, including the black lower legs and muzzle. Last week I took some new pictures just in time for the February IMEHA Show. I’m judging a division for this show, but since the site gets real slow and/or doesn’t work when everyone is trying to judge, I can’t work on that right now. So I’m posting about my latest photography technique… using the stove! This is a pretty simple yet effective set up. 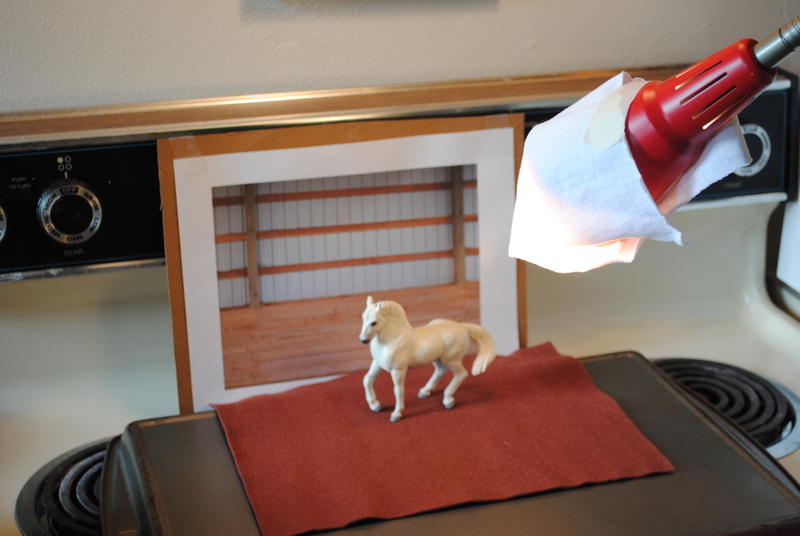 I’ve got a felt ground cover with a background printed and mounted on cardboard (I’m tickled because the picture is actually of my friend’s arena back home where I ride my own horse). There’s light coming from the small window to the left of the stove, above the stove, and the red light. I covered the red light with white fabric (just a cut up t-shirt plus masking tape) to diffuse the light and prevent harsh shadows. The one thing about using the stove light is that you need to be able to adjust your camera’s white balance, since stove lights are harsh and yellow. 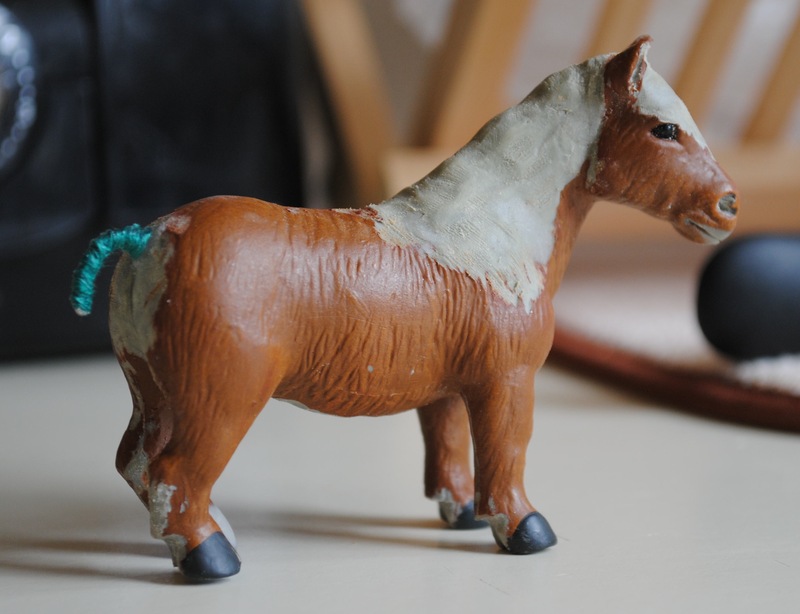 My results suggest that this strategy would work well for classic and traditional horses. But remember to ask your partner/significant other/spouse/housemates/parents before monopolizing the stove with your ponies! I am currently in the midst of finishing my Bachelor’s degree and finding an apartment in Portland, while maintaining school and work here in Washington… but happily I am still finding some time to sneak in with the ponies! I want to get things to good stopping points before I have to pack them up for the trip to our new home. 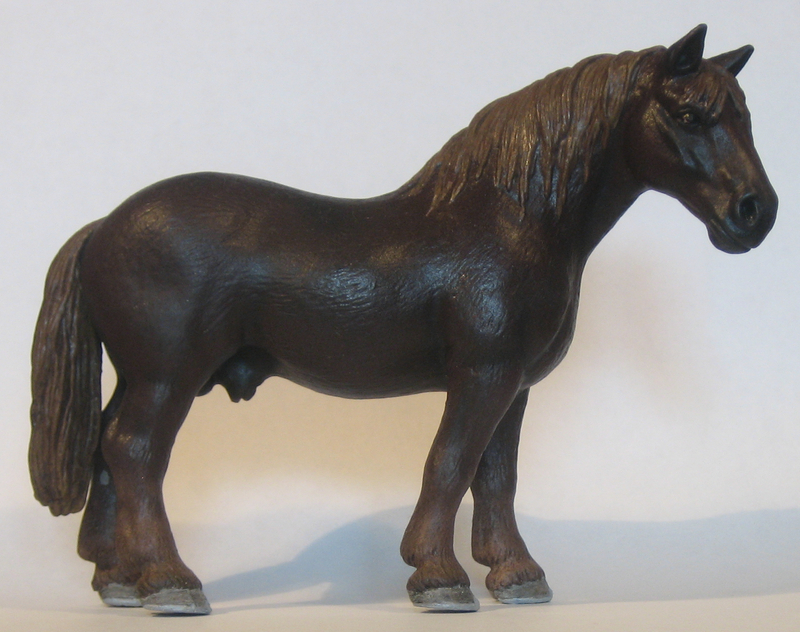 I am very happy with my little pewter rearing horse from EquineArt Creations/Maggie Bennett. She still needs detail work and another layer or two of body pastels, but she is at the stage where she starts to look decent. 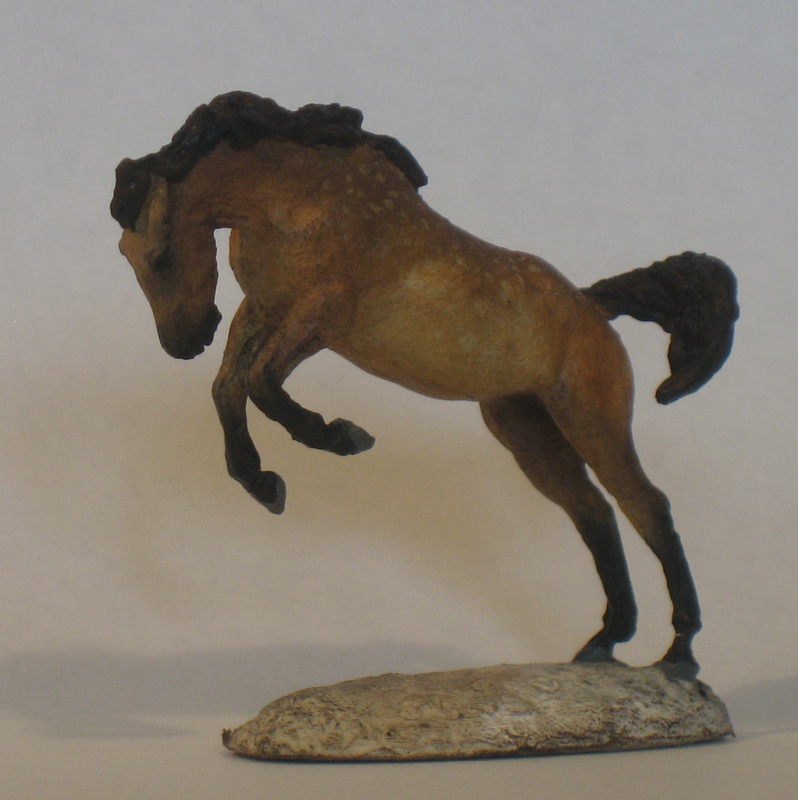 This amazing sculpture is micro mini sized- just over 4 cm at the top of the mane! I was thinking of giving her some small white markings (a snip and a coronet band or two), but I need to do a bit more research first. I’ve assigned her the breed of Azteca, but I haven’t researched yet to see if Aztecas (or Andalusians and Criollos, which make up the breed) are inclined to have white. Aztecas are a cool breed for models, because there are different types of Aztecas depending on how much of the horses heritage is Spanish (Andalusian or Lusitano), Criollo, or Quarter Horse. I found a great cross breeding chart here. My mare is an Azteca A: 1/4 Criollo, 1/8 Quarterhorse, and 5/8 Spanish. I’m still working on a name, however. 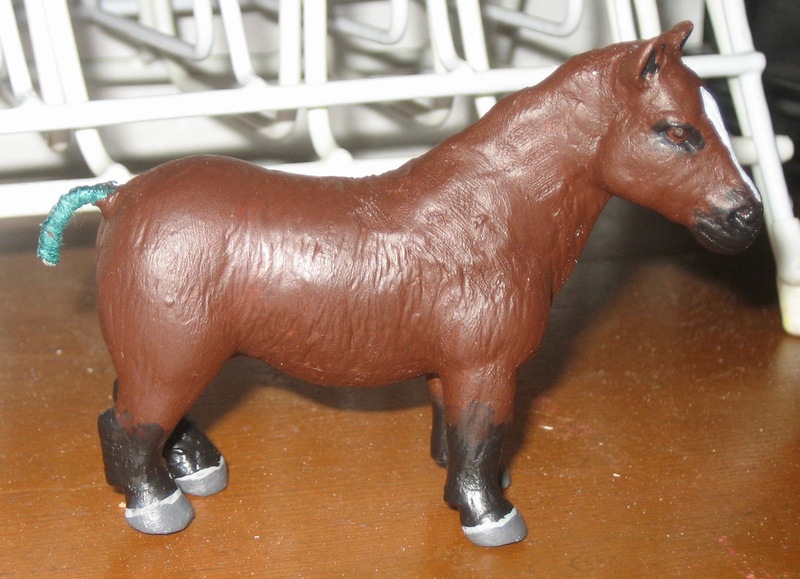 I’ve been working on this Safari Percheron (now a liver chestnut Suffolk) for months and he has had multiple names during that time… Nottingham, Morriarty… the latest is Goshgarian. We shall see. I am also deciding if I want to sell him or not. 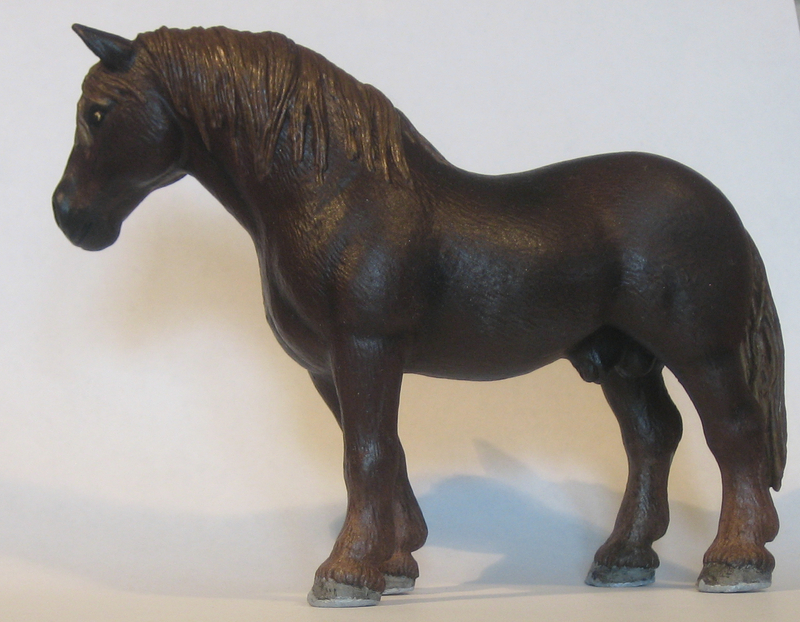 It took me a while but I did find reference pictures and even potential bloodlines for dark liver Suffolks. I don’t do pedigree assignment, but I wanted to make sure a Suffolk could be this dark since other draft breeds didn’t particularly fit the mold. I’ve got quite a few things in the works, hopefully with some good progress this week: Chryselephantine, a golden palomino ASB mare; chestnut micro mini cantering sport horse; english saddle and bridle; Troy Soldier, the bell tailed mule; a light palomino centaur; and my frankenstein SM foal.